First things first, i’m going to assume you’re running Windows Server 2012 / R2, and have not yet installed the FSRM role [if you’re running 2008 R2, skip to near the middle of this article]. Reboot your server if prompted. Set-FsrmSetting -AdminEmailAddress "youremailaddress@domain.name" –smtpserver "IP Address of your mail server here" –FromEmailAddress "servername@domain.name"
You may need to make some adjustments on your mail server for this to work. Next up, we’re going to configure a new FSRM file group. This is where the twist comes in – your actually going to block EVERY FILE TYPE, then ONLY allow the filetypes you know are safe – completely eliminating the need to maintain a block list. The script below will cover the main filetypes but you’ll need to tailor this to your environment. My recommendation is to install WinDirStat and perform a scan of the share you are targeting. This will list all of the extensions currently in use within the share. 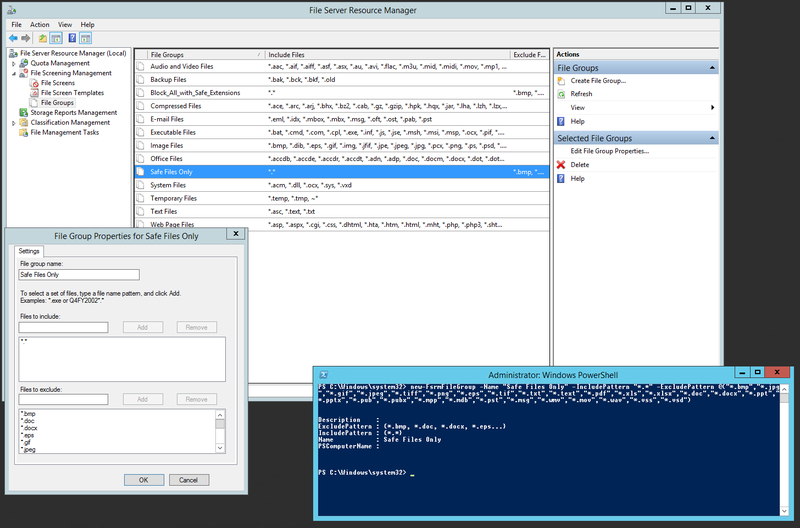 Open the File Server Resource Manager GUI. Make sure Send warning to event log is ticked. Hit OK. 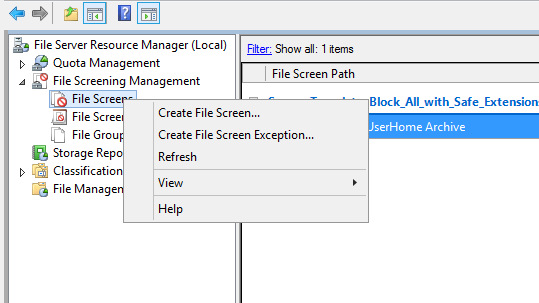 This will record file blocking events to event log. This will help diagnose any issues later. Browse to, and select your share path. From the “Derive properties from this file screen template (recommended)” drop down, select “Allow Safe Files only” and hit create. The first file, filename.txt should be created. Shortly after your attempt, you should receive an email alert. Using this information you’ll be able to track down the user; determine whether the file was legitimate, or a virus, then take the appropriate action (ie add the file extension to the safe list, or quarrantine the infected computer). 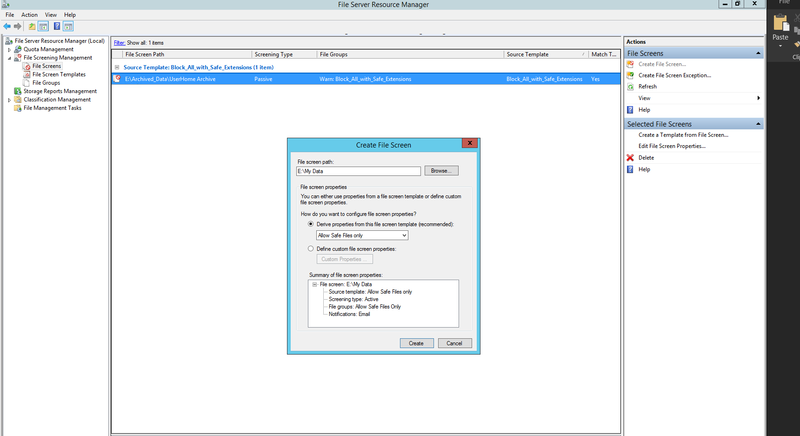 If you’re looking to do with with Windows Server 2008 R2; you’ll need to run a few different commands, and perform a little extra work in the GUI. filescrn Filegroup Add /Filegroup:"Allow Safe Files Only" /Members:"*. *" /Nonmembers:"*.bmp|*.jpg|*.gif|*.jpeg|*.tiff|*.png|*.eps|*.tif|*.txt|*.text|*.pdf|*.xls|*.xlsx|*.doc|*.docx|*.ppt|*.pptx|*.pub|*.pubx|*.mpp|*.mdb|*.pst|*.msg|*.wmv|*.mov|*.wav|*.vss|*.vsd|*.fmp12|*.7z|*.zip|*.ppsx|*.ldb|*.avi|*.log"
filescrn template add /template:"Allow Safe Files Only" /Type:Active /Add-Filegroup:"Allow Safe Files Only"
Expand file Screen Management, File Screen Templates. Select the “E-mail Message” tab. Warning!! You have attempted to save unsecure file type – contact ICT immediately! You have attempted to create or save an unsecure file type - [Source File Path] on [File Screen Path] on server [Server]. These file types are blocked by the following rule: [Violated File Group]. If this was unintentional, this could indicate that your computer has been infected with a virus. Please contact ICT immediately for support. Select the Event Log tab, make sure send warning to event log is ticked. Click OK. (you maybe warned that you have not configured your SMTP server yet. Click Yes. we’ll do that next). Select “Apply template only to derived file screens that match the original template”. In the options window, select the Email Notifications tab. Enter your server & email details. If users are prevented from saving certain files, but you’re sure that you have added in the correct file types, it maybe the application uses another file type to write a temporary file first. Open Event Viewer (type: eventvwr.msc into the run box). Head to Windows Logs, Application. Look for Event ID 8215, SRMSVR. This will list each blocked file. Look for the .filetype thats being blocked and add to the exceptions list.